My game of the year for 2017? Obviously Overwatch. Oh—sorry. *Puts finger to earpiece*. That came out last year? Well. Hm. In all honesty, I’ll echo the “2017 was a stellar year for games” consensus. This was a year for experiments that worked and exceeded expectations. So many games blew me out of the water. That said, while I do invest in big single-player releases, finishing some but drifting away from others, I tend to play a lot of multiplayer games. I’d rather sink 600 hours into a killer multiplayer game than 70 in an open-world epic. Here are my favorite games of the year, in no particular order. I initially thought that the queer dad dating simulator was a gimmick, but playing it, it’s immediately apparent it is not. The story goes that you’re a single dad with an upstart, snarky teenage daughter to raise. You just moved to a new neighborhood full of hot, queer dads, who happen to all live right near you. It’s a given that Dream Daddy has a sense of humor—it’s a font of endless dad jokes, plus some left-field absurdist humor that leaves an anime-style sweatdrop impression. It relays a story of single parenthood with immense sensitivity and compassion. Its mini-games are righteous. All of its characters are well-written: self-consistent, but full of surprises. Dream Daddy was a special, rare joy. A slinky boxing game that’s easy to teach people but has a high skill ceiling will invariably rock my world. Arms’ colorful roster of fighters, killer music and very off-putting, yet charmingly dark world make great wrapping paper for a very solid fighting game. Sure, I have gripes with Arms. In my review, I even called it a one-trick pony. But let’s be real—every step toward getting better at Arms brought me more enjoyment. From playing with new people to competing against seasoned veterans, I found that Arms has a lot going on in its niche. If a game consistently inspires happy screams from me, it’s doing something right. I’m putting these two games in the same entry. Battlegrounds is the simple, but addictive game that swept up millions before it even released in full. Its last-man-standing gameplay, combined with its uncanny ability to (again) make me shout and scream and laugh, makes for lasting memories of good ol’ game times. Fortnite is the game that, in my view, polished what it was going for. I wasn’t a huge fan of Fortnite’s base game, but its battle royale mode is the whimsical and light-hearted Battlegrounds clone I didn’t know I needed. I don’t feel overly stressed out playing Fortnite, even though I go through the same motions as I do during a Battlegrounds game because of its lighter mood and, uh, because I know I won’t have to wait ten minutes to get back into a game. I’m only medium-stressed, the right amount. I much prefer to putting my energy into building barricades than managing inventory, a trade-off that Fortnite wins me over on. Also, its characters’ diverse designs are my favorites of the year. I was pretty mad when I downloaded Splatoon 2 and it looked a lot like Splatoon, a game I played the crap out of on my Wii U. And then, I got excited to play the crap out of its newer incarnation on a better console. Splatoon 2 is an area control game with squid children who wear rad threads. Also, Nintendo’s been consistently adding in new, wild new weapons like a champagne bottle and an umbrella. Splatfests, the multiplayer contests that has players fighting over sweaters vs. socks or flight vs. invisibility, are hype. If you don’t like the shooter aspect, you can customize your inkling. And if you don’t like customization or shooting, the single-player mode rules. 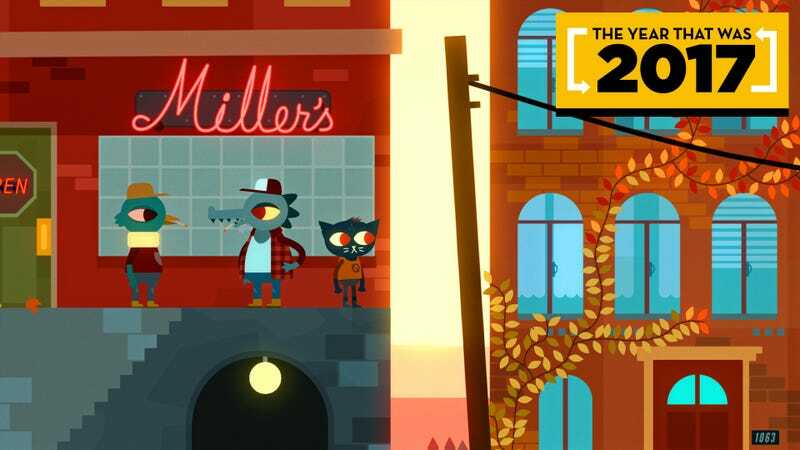 More games should be written like Night in the Woods. It’s a lesson in economy of language. The story, which follows the slacker Mae’s return to her dreary hometown, was evocative, because of its simple writing. In context, a dumb phrase like “caring can be really terrifying” or “I sleep a lot and sometimes eat pizza” felt euphoric to read, like I was 19 again and going through the same dumb revelations over and over. A game made me feel like a ridiculous, sad kid again, and I think that’s great. I’m still playing this one. I got to Zelda late. I’m sorry to say, but I don’t generally like Zelda games or gravitate toward open world games. Being lost and looking for stuff isn’t an escapist fantasy for me; it’s my real life. That’s why I slept on this. Enough people convinced me that the newest Zelda doesn’t feel like its predecessors and that, despite not enjoying games like Skyrim, I’d dig this one. And, oh man, do I. The thing that’s striking me about Zelda is not only that you can do anything, but doing anything feels good. The game never feels like it’s struggling to accommodate my whims. And the infinite possibility it offers never feels intimidating, since its granular elements—climbing, cooking, exploring—are so enjoyable in and of themselves. Crawl has been in early access forever, but it officially came out in April. It’s become my favorite indie local multiplayer game. It’s a creepy and delightful game in which one player is the human and the others are the monsters who are trying to kill him. Whoever gets the last hit regains their humanity, while the previous human returns to being a horrid monster. It’s a constant power struggle across each 30-minute session. Also, it’s got a very, very good balancing mechanic: players who don’t have the chance to regain their humanity as often as others are allotted “wrath,” a currency that lets those players upgrade their monsters into more powerful beasts. That way, no one leaves Crawl with a grudge. First of all, the music. Second of all, the dark sci-fi world. Third of all, those neat switches from platformer to RPG-style camera angles. Man, and those weapons. And that story. Nier: Automata is heartbreaking and enchanting. I’m happy it was made, and I’m happy it was made with all of its idiosyncrasies and big, mind-breaking ideas. And I will never, ever forget how it felt to navigate the carnival zone for the first time and figure out, bit by bit, how it all fit together. This game is a masterpiece. It’s comprised of several ghostly stories about a cursed family and their cursed house strung together. Each short story is haunting, and the ways they involve the player are always surprising. At one point, I fell into a comic book and played out the jarring, horrifying story inside it. Playing, I found myself whispering “Woah!” and “I’d have never thought of that” at least every 30 minutes. A Mortician’s Tale executes its simple premise flawlessly. It’s a “death positive” game in which Charlie, a new mortician at a mom-and-pop funeral home, cremates or embalms corpses. In the morning, she reads her e-mail. During the day, she prepares dead bodies. Later, she attends funerals for those dead bodies. It’s a small, hour-long game that has players going through the motions of morticianhood in an environment that isn’t squeamish about death. I was surprised by how this game eased me into a professional and curious attitude toward cutting open bodies. And I was surprised by how reverent it was of a process so many people shy away from talking about, and how it instilled that in me, too. It was an education on a lot of levels. I left A Mortician’s Tale with a greater understanding of something scary and continue to marvel at how well it did what it set out to do.